After across-the-board losses on Friday, markets are trading relatively flat this morning. After peaking above $62 on Friday morning, crude oil gave up 46 cents (-0.8%), closing the day at $61.44. 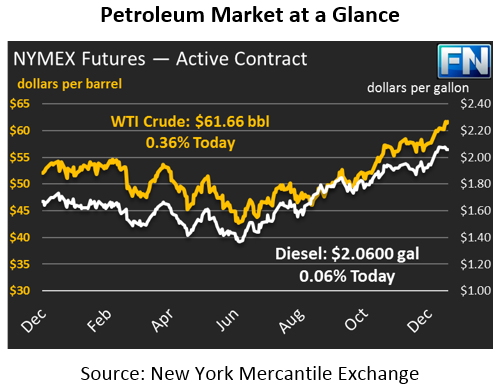 This morning, prices opened at $61.61, and have remained relatively anchored to that price. Crude prices are currently 22 cents above Friday’s close (and just 5 cents above today’s opening price), trading at $61.66. Refined fuels are in a similar position, with diesel falling 0.9% on Friday while gasoline gave up 1.3%. Today, both products are flat/slightly higher. Diesel prices are currently trading at $2.0600, a gain of 0.1 cents. Gasoline is up 0.3 cents, and prices are currently $1.7891. On Friday, Baker Hughes released their weekly rig count data, showing a decline of 5 rigs in the U.S. for the first time in weeks. Declining rig counts signal a slowdown in future production, though the exact relationship with production is not 1:1. The reduction in U.S. rig counts was surprising given rapid increases in oil prices lately. Markets must now consider whether the data was an anomaly, or if producers are cutting back on new drilling. It’s been a little while since OPEC was noticeably in the news. Recently, an OPEC official told Reuters that the organization would not change its quotas in response to small, short production outages. It’s notable that the statement follows the Forties Pipeline leak and geopolitical production risks such as Venezuela and Iran. The statement does beg the question – how much WOULD be enough to cause OPEC to reconsider output quotas? Given the short-term impact such an event would have on fuel prices, let’s hope we don’t find out.